The Russell Hobbs 20780 Glass Line Kettle has something futuristic and yet timeless about it. Made with premium glass, it illuminates blue as it heats the water – and yes, you really can watch this kettle as it boils. This kettle really does think of everything. There is 3kw of power for a rapid boil so you won’t be waiting long for a brew. It has a 1.7 litre capacity jug, so it’s big enough to make up to six cups, yet with being glass you can fill and boil exactly the volume of water you need, helping you to be more energy efficient. There is an easy grip soft grip handle and a Perfect Pour spout to ensure the water goes into your cup without splashing over your work surfaces and it sits on a 360° base so it can be comfortably used by right and left-handed people. Its premium glass housing lets you watch the water boil and it illuminates a beautiful blue light while boiling. 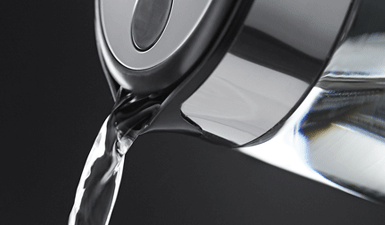 The ergonomically designed Perfect Pour spout means water will streamline into your cup and won’t spill over your work surface on pouring, even if the kettle is full. 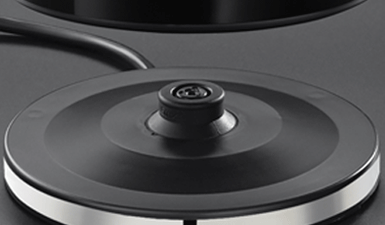 The base makes the kettle comfortable to use whether you are right or left handed and the cord storage keeps work tops neat.